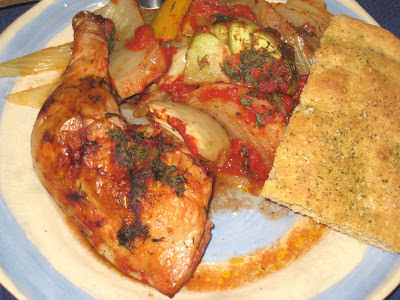 Chicken Baked with Vegetables is the perfect example of how to use what you have to make something delicious, and also illustrates that you do not need a recipe to come up with a quick, delicious dinner. My project to cook more vegetables fell by the wayside a little just before the holidays, and I was having some trouble getting back into the habit of having them on a regular basis. I decided it was time to get back on track with that, so last week I made a point of buying a broad range of produce so I would have no excuse to get cooking. I already had onion and garlic on hand. I had a vague idea of roasting the vegetables but was having some trouble coming up with a method. Saturday morning I finally had the brainstorm to cook the vegetables with chicken, so I went down to the Apple Market and bought four leg quarters. Once I had the chicken, everything fell into place. I will post a recipe for this, but it should be looked at as more of a template than an item-by-item list of ingredients. I used the crushed tomatoes because I had some leftover from a previous dish. If I did not have them, I would not have used them and might have added some broth or a little more olive oil. If I did not have the fresh dill I would have added dried basil or marjoram to the thyme. If I did not have the fennel and the peppers I would have used potatoes and carrots. If I didn't have the chicken I would have cooked the vegetables alone and served them alongside whatever meat I was using, and if I didn't have any meat I would add some legumes and serve it with brown rice or pasta to make a complete protein. I purposely used a large amount of vegetables in comparison to the chicken. That satisfies my goal of eating more vegetables and keeps this dish relatively low in calories and high in fiber. It couldn't be any easier and the possibilities are endless. Give it a try and you'll see what I mean. Arrange the vegetables in a 13" by 9" baking dish. Season to taste with the salt and pepper, then crumble the dried thyme on top. Sprinkle the olive oil over the vegetables. Lay the chicken quarters over the vegetables, then season with the salt and pepper. Pour the crushed tomatoes over the chicken, then sprinkle the chopped dill over the tomatoes. Cover loosely with foil and bake for 30 minutes. Remove the foil and cook another 40 to 45 minutes uncovered, until the skin is crispy and the juices from the chicken run clear.